Zoe Buckman is a multi-disciplinary visual artist, activist and mother. Originally from East London, she now lives and works in New York. Buckman powerfully weaves together art and activism into pieces that draw viewers in with aesthetically pleasing beauty, while offering an undercurrent that inspires deeper contemplation on political issues. Buckman speaks to the process of transforming what she sees happening in the world around her into thought-provoking works of art. With creations such as “Let Her Rave,” “Mostly It’s Just Uncomfortable” and “Every Curve,” her work beautifully weaves together the feminine with the fierce, sparking conversation around feminism, mortality and equality. Buckman shares how her activism informs her art and how both inform her parenting of her young daughter. After admiring Zoe Buckman’s work for years, Samantha Paige was excited to sit down with her to talk about art, activism, the shared experience of mothering daughters in this moment in time and the power of last cuts to wake us up and foster change. 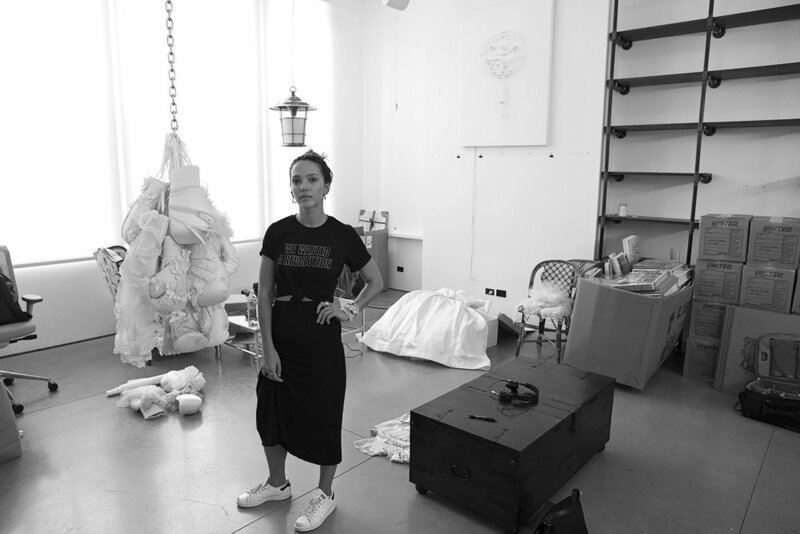 To learn more about Zoe Buckman’s visual art and upcoming projects, including her 2018 LA installation with Art Production Fund, please visit zoebuckman.com or @zoebuckman on Instagram and Twitter.